WHAT IS LINKING LANDS ALLIANCE? 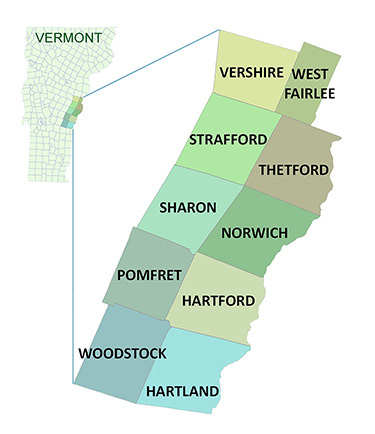 Linking Lands Alliance (LLA) is a grassroots, collaborative group of community members from ten Vermont Upper Valley towns working to address natural resource issues that transcend town borders. The Upper Valley of the Connecticut River is rich in wildlife and natural beauty. As our population grows, protecting natural areas and working landscapes becomes essential to our continued enjoyment of the valley’s natural assets. LLA’s first project focused on identifying important natural habitats and connecting lands that support our region’s large, wide-ranging wildlife species. Native black bear, bobcat, fisher and moose require huge acreages, often spanning two or more towns, to find food, shelter and successfully rear their young. By identifying and protecting habitats and travel corridors vital to these animals we can also help ensure the ecological health of a multitude of other plants and animals that make up the valley’s natural diversity and beauty. LLA partnered with the Community Wildlife Program of the VT Dept. of Fish and Wildlife to develop habitat maps in our ten towns. The first component of the initiative drew upon the extensive knowledge of state and local wildlife experts to identify and assess natural areas and features representing a broad range of habitat types and sizes within the region, including large land tracts supporting bobcat and other far-roaming species. The second component sought input from local townspeople to identify the special places in their town they value for outdoor recreational opportunities, aesthetics, or to experience unspoiled nature and quiet solitude. Having maps of wildlife habitat across the region allows residents to visually assess natural areas important to both wildlife and themselves and provides a starting point for stimulating neighbor-to-neighbor and inter-town dialogue that encourages good land stewardship and protection of significant wildlife habitat. It is also hoped that the natural areas and habitat connectivity maps will serve as tools to help guide land use in the Upper Valley. LLA Regional Maps: Thanks to Jens Hawkins-Hilke, Conservation Planning Biologist and Scientist Team. Website costs $175/year, please donate to keep this website alive.